My husband makes me Pho when I’m sick. How awesome is he? From scratch, broth and everything. In return for his many turns at making Pho, he asked that I make his favorite: Matzo Ball Soup. As background, my husband is from New York. Queens, New York. I am not, I am from the great State of Maryland. We in the mid-Atlantic have managed to get him to like crabs, oysters, and call “stripers” “rockfish”. His accent is almost gone, which is sad because it wasn’t really super-pronounced, but it was cute. He loves Jewish delis and worships the foods contained therein. I have never been to a Jewish deli. I never had Matzo Ball Soup until December 2012. The hubs was so excited to find a real Jewish deli near his work that he brought home a container of Matzo Ball soup last winter for me to try. It was really, really good. 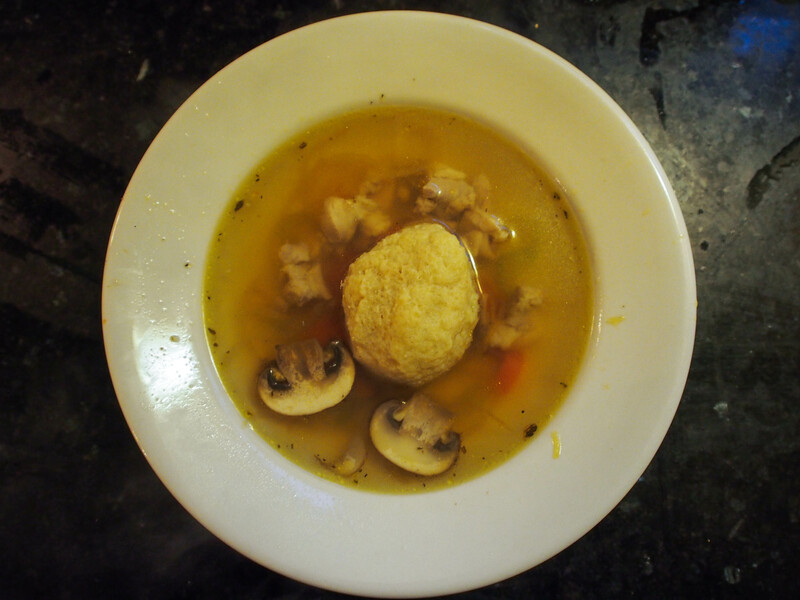 But as I looked at the ball in the soup and what I remembered a Matzo to be, I couldn’t see how the transformation was completed. When he came down with a cold, he asked me kindly to make the soup. How could I say no? Every time I’m even slightly under the weather, he makes me Pho. No small undertaking that deserved to be rewarded. So, I looked through all of my iconic cookbooks and found no reference to this soup. That happens, as there are some recipes you are just supposed to “know”. 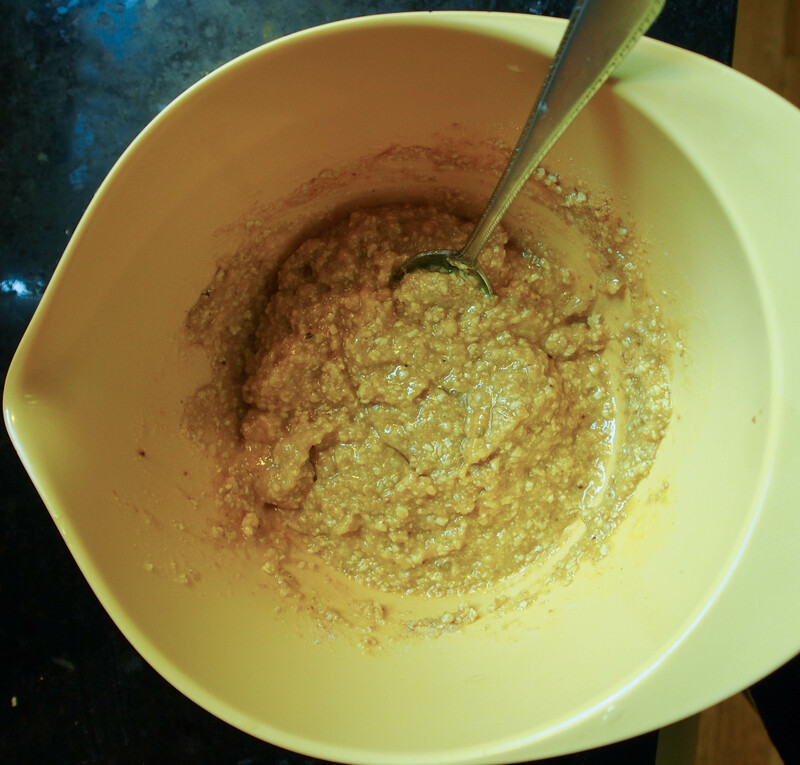 After searching the internet, I came across a recipe from Deb Perelman from Smitten Kitchen that seemed to be very easy. 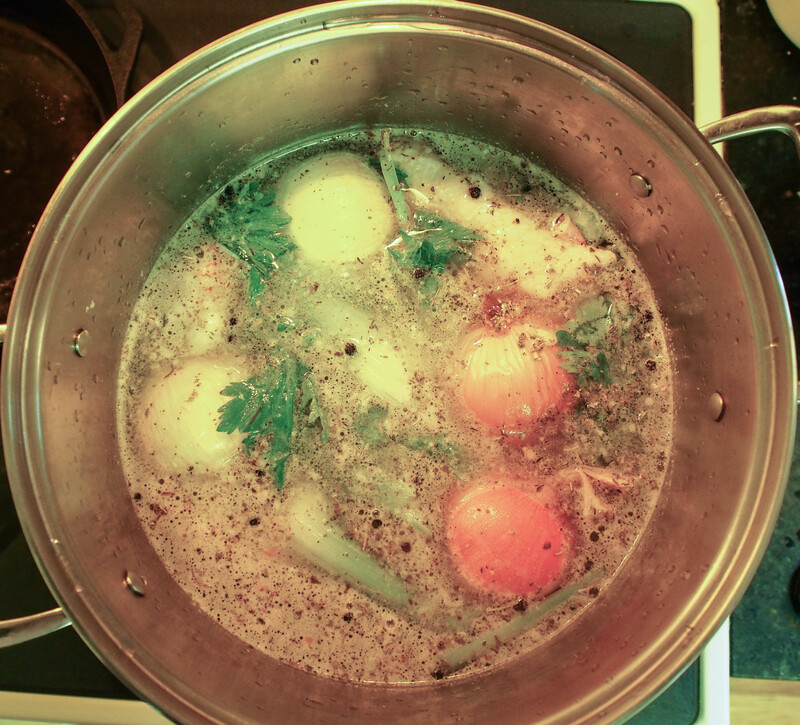 First, the stock. I throw the carcass of the pastured chicken we had the night before into a 12 quart stock pot. Along with the carcass (I like that gross word for some reason), I threw a few carrots, two onions, few stalks of celery, few cloves of crushed garlic, couple of bay leaves, 1 teaspoon of thyme, 1/2 teaspoon of tumeric (for color), a small handfull of peppercorns and 2 tablespoons of vinegar into the pot. I covered with water (and then some) and let simmer most of the day. Vinegar? Did I write that? Yes, yes I did. You are putting so much water in the pot, you won’t taste it. In my 1800s cookbooks, they advise the addition of vinegar to help draw the nutrients from the bones. Occasionally during the simmering, you are going to want to skim the broth of the fuzzy white stuff shown above. Just take a spoon and lightly skim the surface. Now, traditional Matzo Ball soups add a sprig of dill in the recipe with the carrots and Matzo Balls and call it a day. I, however, am a blank slate with this soup and thought that it seemed awfully carb heavy as written. So, I added veggies and some of my leftover chicken to the soup to make it more of a “meal” for my beloved patient. Plus, after all of this work, I didn’t want to have to cook dinner for the kids. Apparently, what I did is considered defaming this great soup. In my defense, there were no leftovers. 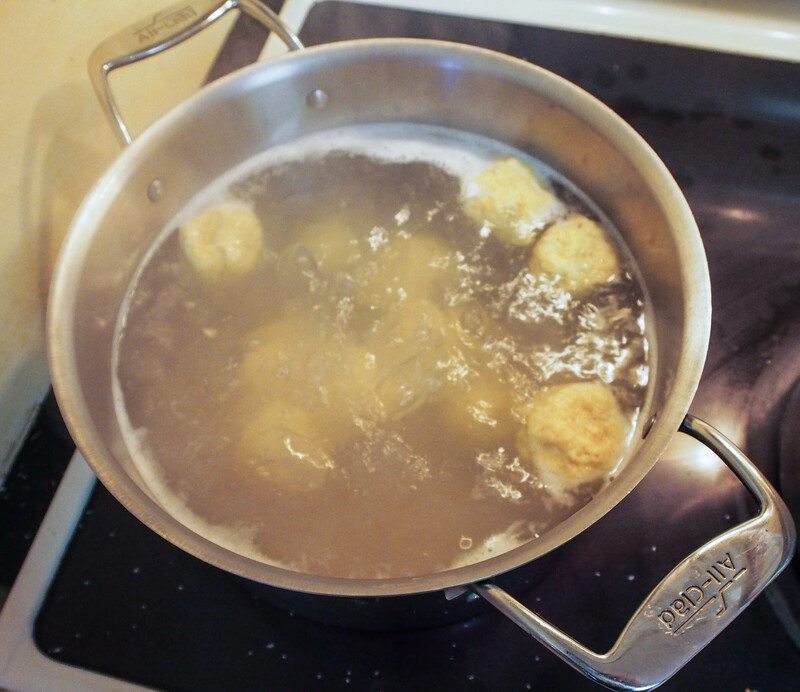 Combine the ingredients for the Matzo Ball together in a small bowl. Cover and place in the refrigerator for at least 30 minutes. Bring 4 quarts of well-salted water to a brisk boil in an 8 quart pot. Reduce heat to allow water to simmer. Thoroughly wet your hands. 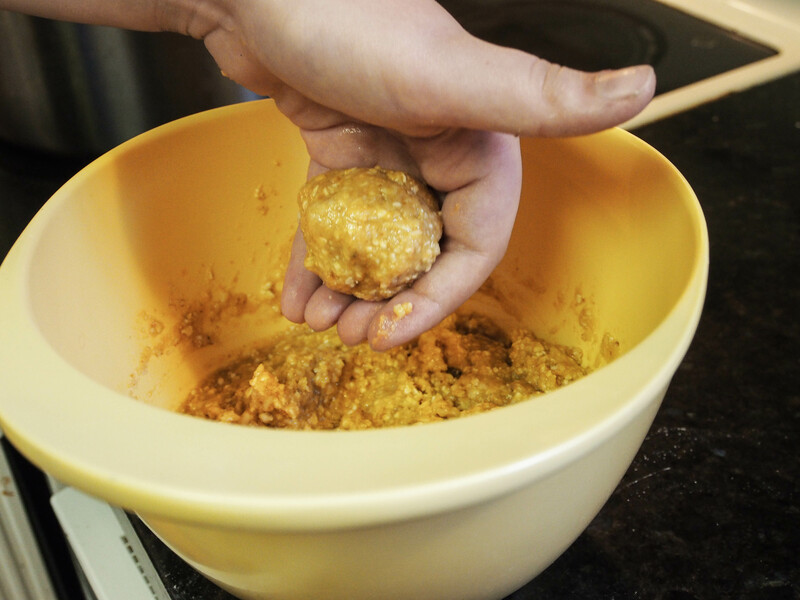 Form matzo balls grabbing a golf ball sized amount of matzo ball batter into the palm of your wet hands and rolling them loosely into balls. Drop them into the simmering salt water one at a time. Cover the pot and cook them for 30 to 40 minutes. Just about 20 minutes before the matzo balls are ready, bring prepared chicken stock to a simmer with chicken meat, allowing the meat to cook thoroughly. As the chicken is cooking, heat the butter in a medium saute pan and saute the carrot, onion and mushrooms until soft and place in the chicken broth. Ladle some soup and a matzo ball into each bowl and top with a couple snips of dill (if desired). Eat immediately. This entry was posted in Main Dishes and tagged Broth, Matzah ball, Matzo Ball, Matzo Ball Soup, Passover, Smitten Kitchen, Soup on March 23, 2013 by dawn of food.